Course runs Friday evening and all day Saturday. Check out the Course Agenda tab below for more details. 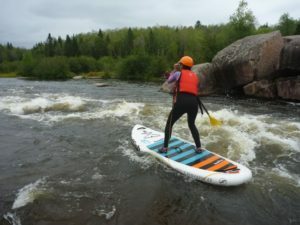 Upon successful completion of this course, paddlers will be awarded with the Paddle Canada River 1 SUP Skills Certification, which prepares you for our other SUP skills courses, such as River 2 SUP Skills and private guiding for river surfing on different standing waves such Sturgeon Falls and Whitemud Falls. If you’ve ever wanted to learn how to paddle rivers and/or surf standing river waves, then this is the course for you! Special Warning: You will have lots of fun and you will definitely get wet during this course! Course Dates: 2019 course dates yet to be confirmed. Please contact us to add your name to the course waiting list. Prerequisites: This course is intended for stand up paddlers with previous experience and who have completed our Advanced SUP Flatwater skills course or equivalent. Participants must be at least 16 years of age. Please note that the course does not include personal clothing or gear, food, or travel. Please see the Gear and Clothing tab. Please arrive about 15 minutes early, so that you are unloaded, changed, and ready to begin at the start time. Arriving late will cut into your instructional time, and that of others on the course. Friday Evening Session (6:00PM – 8:00PM): We will spend the evening reviewing advanced flatwater skills such as running draws, off-side stroke, bracing, edging, and foot positions. This evening session will be held at the Manitoba Canoe & Kayak Center 80 Churchill Drive Winnipeg, Manitoba. Saturday (9:00 AM – 5:00 PM): Saturday will be spent on the Whitemouth River near Elma, Manitoba. Participants will learn about river safety and river paddling skills (eddy turns, ferries, surfing standing waves, etc.). We will conclude the day with a river run down the Whitemouth River. Attention: Course runs Friday evening and all day Saturday. Although we do our best to work through all course content, please note that logistics, location, timing, itinerary or anything else, may be adjusted by your instructor to ensure group safety, comfort and success, over the duration of the course. Brand name paddleboards by Badfish SUP and Blue Planet. Adjustable paddle, leash, PFD, signal whistle, throwbag, helmet. For colder season/conditions: As a minimum we recommend a shorty style neoprene wetsuit or neoprene paddling top combined with neoprene shorts or pants. Food for the day, high energy snacks, drinking water.